It was spices and tobaccos that brought Indonesia its early success in international trade. Now, after years without representation in U.S.-bound cigars, a new variety of wrapper leaf and a modern cigar plant have restored the "Spice Islands" to their former prominence in U.S. humidors. It was an after-dinner chat that led to one of the most significant recent developments in the Indonesian cigar tobacco industry. "One of our Swiss customers suggested casually, 'Why don't you try a shade-grown leaf in Indonesia?'" explains Wolfgang Kohne of Hellmering, Kohne & Co., tobacco merchants and growers headquartered in Bremen, Germany. 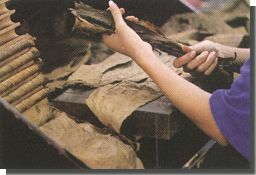 The result was Besuki TBN shade-grown, which today accounts for over 50 percent of all Indonesian cigar wrapper tobacco. Although enjoying success today, it hasn't always been clear sailing for Indonesia's newest high-quality wrapper leaf. "The first two years were a disaster," said Kohne, whose company pioneered the crop and today has 750 acres planted with TBN and another 250 with Connecticut shade. "It was tough getting into the market," he explained. "Buyers either said it looked good but the taste was wrong, or that it tasted good, but didn't look nice." With the support of Indonesia's traditional customers, especially Burger Sohne, Switzerland, TBN tobacco slowly managed to conquer the wrapper market. "When the boom in the U.S. market came, all of a sudden everybody wanted it," says Kohne. Like all producers catering to the U.S. market, the surge in demand was a shock. "We couldn't expand fast enough," notes Kohne, also who serves as the managing director of the Bremen Tabakborse. "Today, the tobacco world would be a disaster without TBN. There simply wouldn't be enough wrapper material." Harry Landsberg of Indoco International - the sales and marketing organization for PT Tempo Reju, one of the major tobacco producers in Indonesia - tells a similar story, claiming that TBN has had a major impact on the country's tobacco industry. Today Tempo Reju boasts one of the largest wrapper plantations in the world, with about 2,500 acres under cultivation, 90 percent of which is devoted to TBN. "We first started when a U.K. company asked us if we could do something with shade-grown," says Landsberg. "The [Indonesian] government organization had already started with TBN, so we began on a trial basis. Then, at the end of the 1980s, Consolidated Cigar had problems with their Cameroon wrapper crop. They turned to us and TBN." The first significant user of TBN, and now a major outlet for this type of wrapper, Consolidated accounts today for more than half of Tempo Reju's TBN production, which totaled over 6,000 bales in 1997. In little more than ten years, a completely new tobacco product and market was born. First developed with Europe in mind, TBN now finds a significant market in the U.S., both because of the boom in U.S. cigar consumption as well as the collapse of a major producer of Brazilian wrapper. TBN moved in immediately to fill the gap. Five years ago it was hard to find a cigar sold in the U.S. with an Indonesian wrapper. With the advent of TBN, the picture has changed, especially in the premium sector. Why has TBN seen such remarkable success? According to Noud van Glabbeek, Swedish Match's vice president of leaf operations, TBN is "... nice to work with. Its advantage is its lack of aroma. It's a bit like a blank canvas allowing you scope to work with the filler and binder." Kohne adds, "The yield is high. It produces enormous, stretchy leaves. They look good. The color is good. And the taste does no harm. So you can use them for practically anything." While TBN shows the most growth potential - due to physical limits on land available for other leaf types - it is far from the only significant tobacco crop in Indonesia. Sumatra leaf, with its unique, spicy flavor, still accounts for the lion's share of the nation's tobacco exports. Favored by European smokers, it has been absent from the U.S. since the end of World War II. 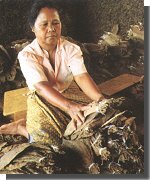 About 70 percent of Indonesia's Sumatra leaf is used as wrapper, the remainder as filler and for chewing tobacco. Next in production output comes Besuki TBN - 75 percent of which is used for wrapper - followed closely by Besuki NO. Besuki is produced in similar volumes to TBN, but generates lower values, with 30 percent used as wrapper or binder, and 70 percent as filler. Finally, there is Vorstenlanden, with a shade-grown variety, VBN - predominately a wrapper leaf - and the regular NO, 30 percent of which is used as wrapper, 70 percent as filler. While Sumatra is almost exclusively destined for Western European markets, the other varieties are finding their way into the U.S. and Central America in increasing quantities. Concentrated in the island of Sumatra and in Central and East Java, the Indonesian tobacco industry has undergone a substantial change since its beginnings about 150 years ago, when it was dominated by the Dutch. Following independence, the government took over all Sumatra and Central Java (Vorstenlanden) production, reaching an exclusive marketing agreement in 1959 to distribute all of its output through the Bremen Tabakborse. Besuki production in East Java, which remained in private hands, was also distributed through Bremen. That changed six years ago when Besuki exporters took things into their own hands, no doubt influenced by the runaway success of TBN. Today, there is only one producer of Sumatra leaf, and it is state-owned: crops are grown on government land in the north of Sumatra, near the city of Medan. Vorstenlanden is produced exclusively by another state-owned organization, with plantings on a government estate near the city of Yogyakarta in Central Java. Both types of tobacco, as well as wrapper and binder leaf from Vorstenlanden, are still marketed through the auction system in Bremen today. Besuki NO, on the other hand, is grown in East Java, around the city of Jember. Farmers with small plots, some under contract, grow almost all of the crop with pre-financing from exporters to enable them to buy fertilizer and pesticides. Others grow the leaf on spec to be sold on the open market. In the latter case, quality is variable. An oversupply, caused by small farmers seizing an opportunity to cash in on a crop that is not dependent on the local market, has caused the price to weaken, although there should continue to be a healthy demand for good quality wrapper and binder. Experimental and development work is being carried out to increase crop yield, as well as to try out new varieties. For example, Tempo Reju expects to produce 154,000 pounds of Candela this year - all for Consolidated - following the first trials in 1997. "Supplies were so short that as soon as our wrappers arrived in the factories, they went straight onto cigars," said Landsberg. Tempo Reju also has a trial program running with something similar to Connecticut Shade. And, while Kohne believes "we should stick to what we know," he happily admits that the Connecticut shade program - a leaf normally suited to the sub-tropics - has been a success so far. Pictured at the Montague factory in Pandaan are, from left: Julian Roebuck, cigar marketing manager, SMNA; Frans Dobebier, director, Montague facility, Indonesia; Sander van Hattem, Montague production manager; Peter Struber, vice president, marketing and business development; and Noud van Glabbeek, vice president, leaf operations. 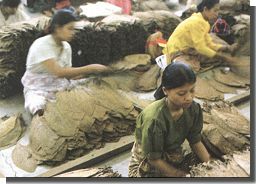 Indonesia's rising profile in cigars isn't limited to strictly growing and curing of cigar tobacco. While it may be true that, as Swedish Match's van Glabbeek notes, "...there's no such thing as an Indonesian cigar," his company has taken a great leap in that direction, setting up the country's first significant premium long filler production, branded the Montague. Swedish Match's factory, in Pandaan near the city of Surabaya, began wrapper and binder cutting and processing in 1993; a swift change of plans was made from the intended site in Sri Lanka once the Indonesian government liberalized the foreign investment laws to allow 100 percent foreign ownership. "It was a big advantage for us because so much of our wrapper and binder is grown here. Transport savings were significant, adding to the economies we were making by moving to a low labor cost country," says van Glabbeek. Today, the modern 32,000 sq.m. factory has 208 bobbin machines, with another 26 on the way, and employs a total of 1,120 people, headed by two European managers. But it was the opportunity to fulfill a longstanding dream of launching a premium handmade brand in the U.S. that led Swedish Match to establish a top-rate handmade cigar operation. 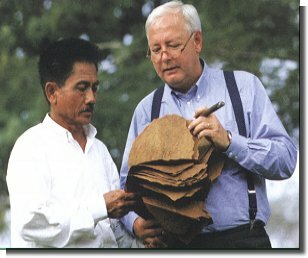 Recognizing that Indonesia was consistently producing high-quality, world-class tobacco, and that Consolidated Cigar - a leading U.S. manufacturer - was already utilizing Indonesian leaf in significant quantities, including a number of its top brands, Swedish Match seized the opportunity to make full use of everything Indonesia had to offer. The goal:to build and launch a long filler brand in the U.S. of the highest quality tobacco leaf and superior construction. "We knew that, as a major player, we should have a long filler cigar," explains van Glabbeek. 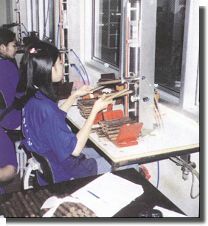 But unlike attempts by other companies to bring long filler cigar production to Indonesia, Swedish Match - the second-largest cigar manufacturer in the world - had the resources and commitment to bring the project to fruition. "Indonesia has a lot to offer," explains Julian Roebuck, cigar marketing manager for Swedish Match's Montague. "We knew we had found something." Training, according to van Glabbeek, was not a problem. "Our workforce didn't know how to roll cigars," he admits. "But we had good Cuban connections, so we invited two of their best cigar makers over. They saw the girls [with the exception of supervisors, the labor force is 100 percent female] and said, 'These small hands can never produce a long filler. We're on the next plane back home.'" But after a decent meal, they agreed to stay. "Three months later they said our people learned faster - and were making better cigars - than their counterparts in Havana were after a year," van Glabbeek says proudly. "And not one person who joined as a hand-roller has left." In the first year of its U.S. launch, 400 people are currently employed on the Montague brand, 280 of them hand-rolling cigars in the traditional Cuban method. The Montague uses a combination of Brazilian (filler and Maduro wrapper), Besuki NO (filler and binder), and Vorstenlanden (Claro wrapper) tobacco. The payoff was worth it: A top-quality cigar that has been received very favorably by cigar lovers. In the Fall 1998 issue of Smoke magazine, Montague earned an impressive 4.4 rating, the third-highest in the book. Despite the economic and political crisis affecting Indonesia, there is only optimism for the Indonesian tobacco industry. To date, none of the major players has been affected by the unrest. 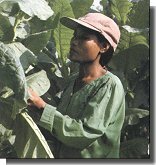 In fact, the renewed political realization that agriculture is vital to the economy, particularly in view of its high labor usage, has placed greater importance on tobacco growers. Nor do they feel threatened by increased production in other parts of the world, specifically Latin America. According to Kohne, the filler market may suffer a little, but Indonesian wrapper and binder tobaccos are so well-established, they have little to fear. The same goes for any lifting of the Cuban embargo. "In my opinion, that might mainly affect Latin American producers," concluded Kohne.